For every theme week I usually recycle models I already have, but I also try to acquire at least one new model to show off that fits the theme. For LaLD Rennsport Reunion that new addition is the car that was my favorite out of all the magic shown off at Luftgekühlt 5: the 1973 Sunoco blue 911 RSR driven at the 1973 Daytona 24 Hours by Mark Donohue and George Follmer. When this Minichamps 1:43 popped up on ebay for a nice price AND ebay kindly send a coupon code, I knew I had to jump on it. First let’s talk about Mark Donohue, the dude who drove the blisteringly fast and powerful Can-Am Sunoco 917/30 that gets blamed for killing the entire series. He started racing during his college years in the late ‘50s in New Jersey, win a slew of SCCA events until he made enough of a name for himself in Ford-powered TVRs to get noticed by the Ford factory team, who signed him up to drive a GT40 Mk. II at Le Mans in 1966. This did not go well, as his long-time friend and mentor, Walt Hansgen, died during practice. Driving alongside Hansgen earler that year Donohue finished 3rd at the Daytona 24 and 2nd at the Sebring 12. With his new co-driver at Le Mans, however, he only managed 12 laps and DNF’ed with a broken differential. He went back to Le Mans the following year after signing with Roger Pense, and alongside Bruce McLaren drove the yellow #4 Mk. IV to 4th place. I guess that must’ve been destiny or something, with all those numbers lining up! 1967 proved to be a pretty great year for Young Mark, as he won 6 out of 7 races (and finished 3rd in that 7th race) in the United States Road Racing Championship driving a Penske Lola T70 Mk. III. He also won 3 races in the Trans Am series that year in a Penske Camaro, and finished 4th at Daytona, and won his class at Sebring. He continued racing for Penske in the USRRC, Trans-Am, Indy 500 (rookie of the year in 1969 and a win in 1972, NASCAR (winning the first race of the 72-73 season in an AMC Matador), and Can-Am (helping develop the 917-10 and 917/30, winning every race but one in 1973 before pulling out the following year to protest new fuel limiting regulations, pretty much ending the series right there). He also became the first IROC champion in ‘73/’74 in a Porsche 911 RSR, winning 2 out of 3 races at Riverside, as well as at Daytona. He only got beaten by the other guy driving the blue Sunoco #6 RSR in this post, George Follmer. Apparently winning too much made him grumpy or something, because his nickname of Captain Nice got replaced by Dark Monohue, which I think is actually pretty clever. He retired briefly after the 1973 season, but instead got pressured to race in Formula one, ultimately killing him as a result of a crash at the Austrian GP in 1975 at age 38. George Follmer, apparently the only guy capable of beating Mark Donohue, raced alongside him in Trans-Am as his team mate on the AMC team, in Can-Am substituting for Donohue, who was recuperating from breaking his leg during development of the Porsche 917-10, and in F1, where he notched 6 wins and 13 podiums in 3 seasons. He also raced in NASCAR, the IROC series, and the revamped Can-Am in the late ‘70s, and finished P3 at Le Mans in a Porsche 956 in 1986. He is one of the lucky guys who made it out of the ‘70s alive and still races in vintage races from time to time. 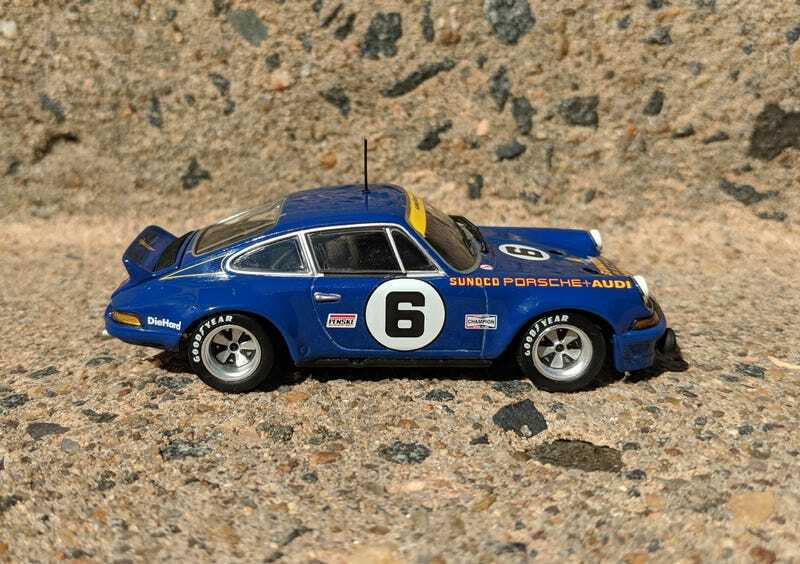 Now (finally) on to the subject of the post, the 1:43 version of the Porsche 911 Carrera RSR that sadly DNF’ed with engine issues at the 1973 Daytona 24 Hours. Donohue and Follmer qualified 12th in the #6 car, and managed to complete 405 laps before the engine gave out, 265 laps behind the race winner, the Brumos Porsche Carrera RSR of Peter Gregg and Hurley Haywood. To me this color is just perfect. It’s striking and works very well with the shape of the car. Add to that the ‘70s flare of the little pinstriping triangle on the C pillar and it completes the picture. Proportions are just right, as one would expect from a Minichamps 1:43, the wheels are excellent, and the decals are spot on. Very happy to have it in the collection!